Botsify offers several ways in which you can put your chatbot in your website. If you have a Facebook Chatbot, then you will have to enable chatbot for website by going to "Settings"
Selecting "Platforms" tab and enabling "Chatbot for Website". After enabling it, you should see a small world icon in the left navigation menu. If you have a Website Chatbot (Manual), you already have this option enabled and you should see a small world icon in the left navigation menu. 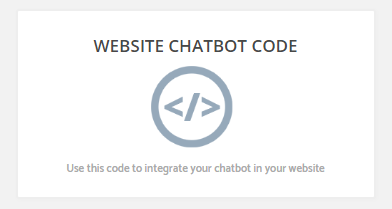 If you have a Website Chatbot (Automatic), you will see an option on your dashboard which says "Website Chatbot Code". If you don't have your website made using WordPress don't worry Botsify provides you two types of widgets to use in your website. The difference between the two is that the code based widget can affect your page element's styling. But the Iframe based web widget loads as an external document element which would not be affected by your page's styling. To paste the widget code simply go to your website code and put the code before the closing body tag (</body>). That's it. If you find it hard to understand and don't want to use the code yourself, you can always use the third option and email the code to your developer who can do this for you.